Dealing with people compared to completing a task is a vastly different skill. 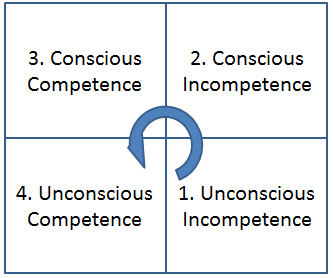 You can deal with a task without having to think but the best leaders I have observed, studied and worked with were constantly “thinking” or to put it another way, operating in their “conscious competence”. Why? Quite simply because no two people are the same. A good leader understands that they are responsible for choosing their words, actions and reactions with the person or people in mind. Or better still, THEY KNOW THEIR TEAM. Here are three things you can start doing right now that will help you understand those you are responsible for. Hugh Mackay in his book “What Makes Us Tick” offers the opinion that the greatest desire of humans is “to be taken seriously”. He suggests that it is our way of saying “Please recognise and acknowledge me as an individual”. One of the first things I did when I took over a team from another very competent leader was spend time with each person individually, sometimes sitting in the car park of their work place eating vegemite sandwiches. But through these efforts I started to understand their motivations for being involved. Everyone is different so it stands to reason that what will energise a person and make their efforts worthwhile will be different also. Take time to write down what you have identified as your individual team members drivers. If you cannot list at least a few points I’d recommend you spend some time getting to know them before trying to lead them. One of my favourite sayings is “no one cares how much you know, until they know how much you care”. Stop and ponder this for a minute. No one comes to work to deliberately do a bad job. People try their best, always. You will never convince me otherwise. When you observe behaviour that isn’t the best, first seek to understand where this stems from. Bad behaviour, poor motivation, lack of commitment are all indicators that trust has been broken or a person feels under valued. As a leader it is 100% your responsibility to “seek to understand”. Ask your team member what isn’t working for them. What don’t they understand or agree with? What aspects of the process are frustrating to them? If this is the first time you’ve done this, be prepared for a bit of a “dump” or maybe some scepticism. Don’t give up, over time you’ll notice a difference. My greatest failures as a leader have been when I’ve allowed outside pressures to influence my behaviour. How did this effect those I was leading, they were on egg shells at times. Conscious self awareness means consistency, which breeds trust, freedom (due to known boundaries) and an atmosphere of being able to get on with a task and not worry about not having all the answers. In short, people know who they are dealing with, what they are getting and what the expectations and likely responses are going to be. They are then free to get on with their role. Before you act ask yourself, “am I under pressure here?” “Am I about to break a promise I’ve previously made?” If the answer is yes then perhaps ask that you defer your decision and then take some time to consider your decision. I encourage you, seek to become conscious of your words, actions and reactions when leading others. Take the time to be consciously competent because then you know what you have to do to keep getting the best out of others.